This recipe is an adaptation of two recipes. One is MaryAnn Espisito's (Ciao Italia) Roasted Fennel and Cherry Tomato Sauce and the other is Ellie Krieger's Tuscan Roasted Chicken and Vegetables. I changed both recipes and sort of combined them together. It turned out great. The fennel tomato sauce is very versatile. As Mary Ann suggests, it can be used as a side vegetable dish, over baked fish, or even as a topping for pizza. And according to Mary Ann the exquisite flavor is due to one key ingredient…sugar. I must say I agree!! In a small bowl combine 1 tablespoon of oil, 1/2 teaspoon of salt, the minced garlic, lemon zest and lemon juice. Rub the mixture into the chicken and let marinate for 1/2 hour. Remove the outermost layer of the fennel bulb and discard. Cut the bulb in half so that each half retains part of the stem end. Cut each half into 8 thin wedges so each wedge is held together by a little piece of stem. Put the fennel, tomatoes and garlic halves into a large baking pan. Toss them with 2 tablespoons oil, 1/4 teaspoon of salt and 1 teaspoon sugar. Roast in the oven for 30 minutes, then give the vegetables a stir and arrange the chicken pieces in the pan with the vegetables. Cook for about 17 to 20 minutes more until the chicken is done and the vegetables are tender and beginning to brown. Place chicken on a serving platter. 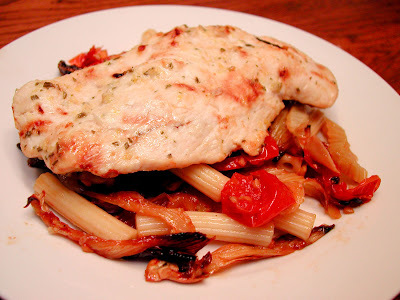 Toss the fennel tomato sauce with the cooked pasta and serve along side the chicken. Great recipe. Thanks for posting! This is definitely my style of cooking/eating. I love Italian food, pasta, vegetables, chicken. Are you a big fennel fan? I like it; it's really different. I did something with it one time with orange. Emilie, I love fennel. I am discovering new ways to use it all the time. I think my favorite is roasted though!